A tick collected on field trip led by University of Rhode Island professor Thomas Mather, a tick-borne disease expert. 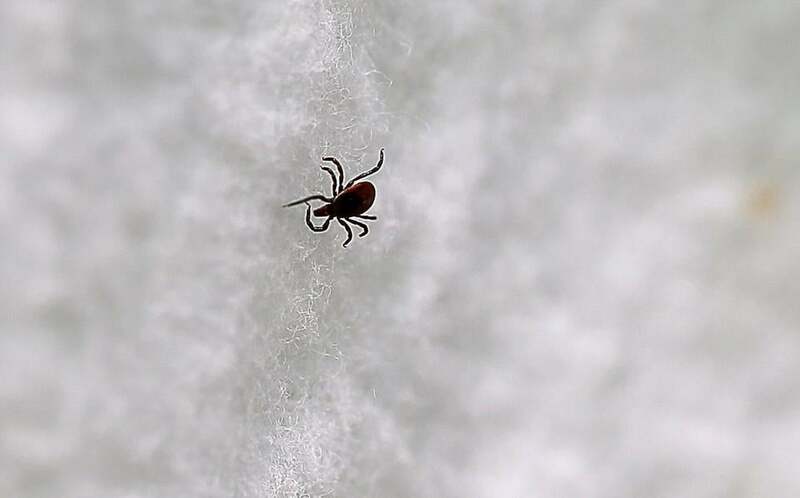 Three people in the Northeast who abruptly died in the past 13 months had an undetected heart inflammation caused by Lyme disease, according to a federal study that suggests death from the deer tick-borne bacteria is more common than previously thought. The study was prompted by a tissue bank doctor’s discovery of an odd pattern of inflammation in the heart of a Massachusetts man who was found dead after a car accident a year ago. Testing showed the man had unrecognized Lyme disease, which probably led to cardiac arrest, causing his car to veer off the road. He and the other two patients, from New York and Connecticut, were all between the ages of 26 and 38, researchers reported Thursday. None was known to have Lyme disease before dying. Only four deaths have been previously attributed in published medical reports to heart inflammation caused by Lyme disease, but the infection is a growing problem in the United States, particularly in the Northeast. Officials at the US Centers for Disease Control and Prevention say they are troubled by the recent cases, but their investigation so far shows deaths from Lyme heart complications are still exceedingly rare. The CDC is urging people in New England and other areas with a high incidence of Lyme disease to see a doctor immediately if they experience heart palpitations, chest pain, light-headedness, fainting, or shortness of breath, in addition to more commonly recognized Lyme symptoms of fever, rash, and body aches. There are an estimated 300,000 cases of Lyme each year in the United States, most in the Northeast. Only about 1 percent of Lyme patients are believed to have severe heart inflammation, known as carditis, which is treatable with appropriate antibiotics and, in rare cases, a pacemaker. But the fact that otherwise healthy young people with no significant symptoms could unexpectedly die from undiagnosed Lyme disease adds to health officials’ growing worries about the disease discovered 40 years ago in Connecticut. “The discovery . . . made all of us nervous,’’ said Catherine M. Brown, Massachusetts public health veterinarian and one of the authors of the report. She said it underscores the need to prevent Lyme disease in the first place and to identify it early so that patients get appropriate antibiotic treatment. The deaths occurred between November 2012 and last July, and health officials did not identify the victims. The investigation began after the Massachusetts man was found unresponsive in a car after it went off the road. There was no sign of trauma, and he was pronounced dead at a nearby hospital. He was an organ donor, so his heart was recovered by the New England Organ Bank and sent to CryoLife Inc., in Georgia, a tissue processing and medical device company that provides heart valves and patches for cardiac surgery. CDC officials said the man had early signs of coronary artery disease, but it is unknown whether that increased his risk for death. During a pathology examination of the man’s heart, a CryoLife doctor, Thadeus Schulz, noticed an unusual pattern of inflammation around blood vessels in the heart that was similar to features he had seen in biopsies from people with Lyme disease when he worked in New York, said Dr. Gregory Ray, medical director of CryoLife. “We were curious: There was no history of Lyme disease, no characteristic rash,’’ Ray said. The CDC was called, and tests revealed that the man had recently been infected with the bacteria that cause Lyme disease. A transplant did not go forward. Later, a relative of the man said he had complained of malaise and muscle and joint pain two weeks before he died. He lived alone with a dog that frequently had ticks, the report said. Officials believe the heart inflammation caused him to go into cardiac arrest while driving. Eight months later, Ray was examining another heart as part of the tissue process, this time of a New York resident who had collapsed at home in July 2013. He saw the same type of pattern Schulz had seen and called the CDC. Again, tests came back consistent with an early case of Lyme. The patient, who had a diagnosed heart abnormality that rarely causes death, was reported to be a hiker, but had no known tick contact or rash. CDC officials then began examining unexplained deaths and found a Connecticut resident who had collapsed while visiting New Hampshire in July 2013 and had complained of anxiety and shortness of breath in the 7 to 10 days before death. That person, who lived in a heavily wooded area that ticks prefer, had been prescribed medicine for anxiety the day before death. Tests revealed that the person was infected with the Lyme bacteria. CryoLife also reviewed 20,000 pathology reports of cardiac specimens dating back to 2004 and did not identify any additional confirmed cases. The Connecticut patient had one cornea transplanted before Lyme was discovered, but the recipient died of unrelated causes. The New York state residents’ corneas were transplanted into two different people, but they did not report signs or symptoms of Lyme and were treated with antibiotics as a precaution. A spokesman for the New England Organ Bank said in an e-mail that the organization takes a number of precautions to reduce the chances of disease transmission through tissue transplants. Because most donated tissue, though not corneas, does not have to be transplanted right away, there is time to perform multiple tests. Most corneas are transplanted within five to seven days. There is no Food and Drug Administration requirement to test for tick-related diseases in tissues, spokesman Sean Fitzpatrick said. Doctors who study Lyme disease said more information is needed about the prevalence of deaths from heart inflammation. Dr. John Aucott, an infectious disease specialist in Maryland, said the cluster of deaths could be merely a statistical anomaly, but it could also indicate the emergence of a strain of the Lyme bacteria that prefers the heart. The CDC’s Forrester said he did not believe that it was due to a change in the bacteria strain, but testing was ongoing. Dr. Stanley Plotkin, emeritus professor of pediatrics at the University of Pennsylvania and a vaccine specialist, said the report shows the urgent need for a vaccine against Lyme. His son, Alec, collapsed in August 2005 outside Philadelphia while walking his dog. An alert doctor at the hospital Alec was taken to realized he had Lyme and successfully treated him with antibiotics and a pacemaker. “I think it is unconscionable and a discredit to all parties — public health, manufacturers, Lyme activists — that no Lyme vaccine is available to humans while there is one for dogs,” he wrote in an e-mail Thursday. Beth Daley can be reached at bdaley@bu.edu. Follow her on Twitter @BethBDaley.